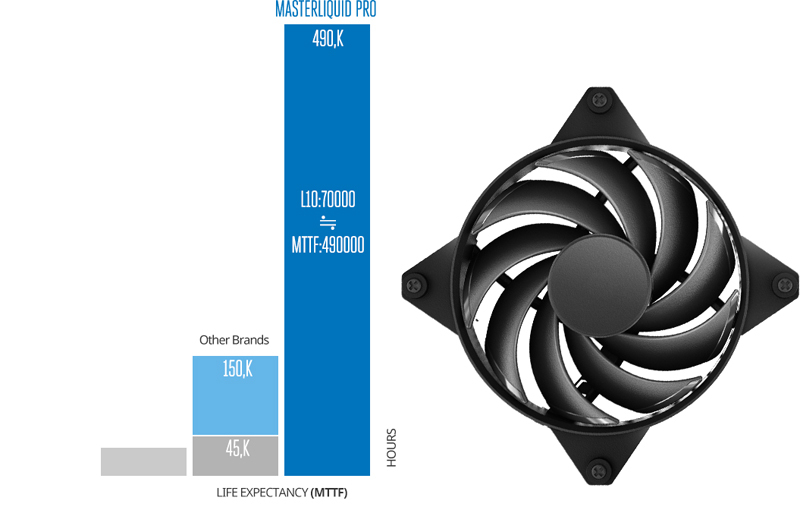 The MasterLiquid Pro 280 All-in-One liquid cooler is ideal for power users and DIY professionals that want to push their systems. Based on Cooler Master's expertise in thermal technology and introducing an array of improvements, this model features a larger surface area on the copper base, a quiet pump, a dual-chamber water block where the pump is kept from hot stuff, and square radiator fin design. 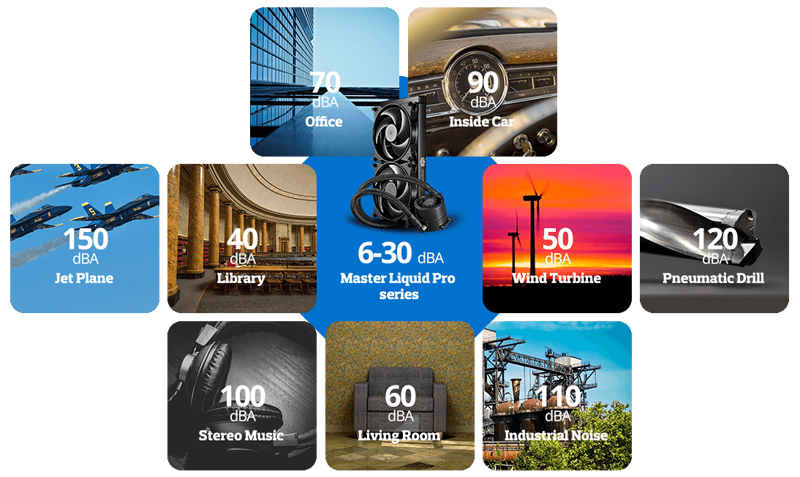 The result is a highly reliable water cooling solution that performs better, lasts longer and operates at whisper sound level. Plus, this self-contained water cooler is pre-filled, easy to install and requires no maintenance - upgrading your CPU to liquid cooling could never be easier. Starting with the hot CPU, FlowOp looks to optimize the flow of liquid, enabling it to carry heat quickly and efficiently away from the CPU while preserving the lifespan of the components. 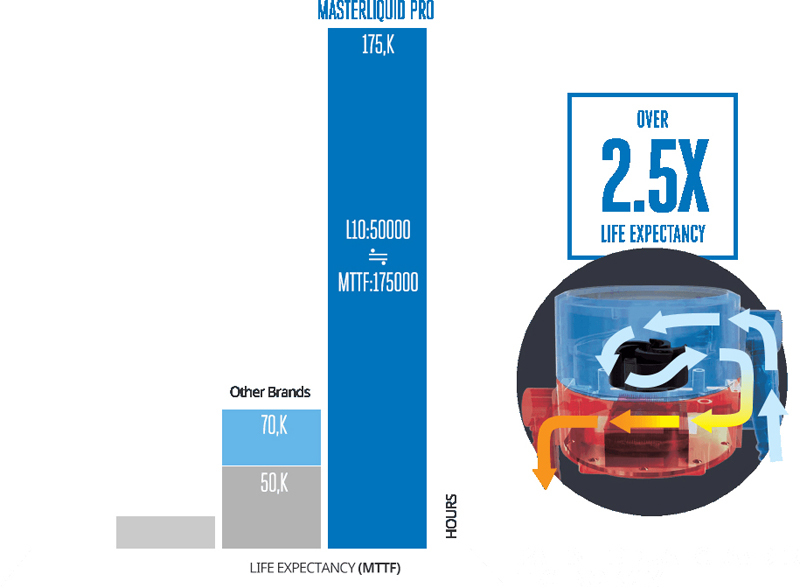 To achieve this, improvements are made to practically every phase of the MasterLiquid Pro's cooling loop. An extra chamber is stacked on top and is engineered so that cold stuff can go in, but hot stuff can't go back up. The cooler upper chamber is where all of the vital components reside. 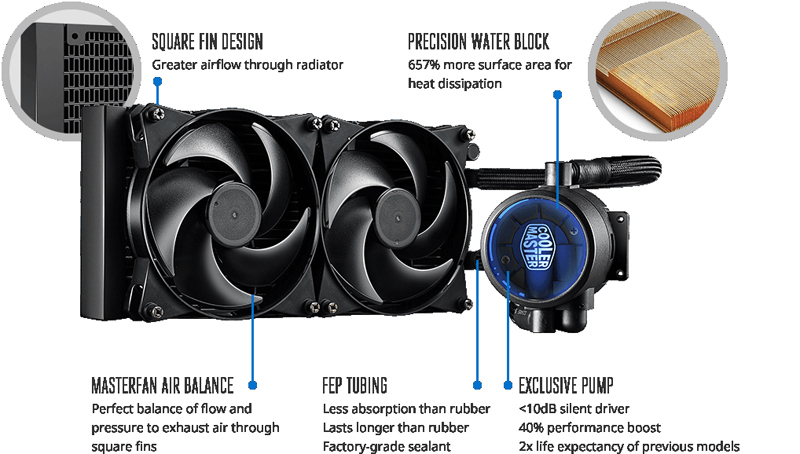 Cooler Master grabbed technology from top-end DIY liquid cooling kits to create a powerful pump that sprays liquid directly at the center of the water block. It solves the issue of slow flow and makes it possible to mount more ultra-fine fins on the copper base, creating more surface area from which the coolant can take away heat. Adding to that effort towards silence, this model encased the pump needed to drive that concentrated spray at the CPU with a silent driver. The custom driver rotates way more smoothly than any other technology out there, reducing noisy clicks and vibration. It's like you're using a V8 engine and can't even notice. The MasterLiquid's unique square fin design creates greater surface area for absorption of the heat and allows for spacious airflow. The increased space means it's possible to use a quieter fan that pushes air farther out of the case. It's really quiet. The spacious square fins gave the cooler the ability to use the all-new MasterFan Pro Air Balance fans. The blades push air farther out of the case and are quieter than high static pressure fans. And they'll last just as long as your liquid cooler. Many of Cooler Master's products are known for their easy installation. To fit MasterLiquid Pro lineup to the motherboard and install fans, all you need to bring are your two hands and a screwdriver.